Admittedly, there is some disconnect between myself, sitting at a desk in downtown New York City, and the tranquil, idyllic spires of Cambridge University. Cambridge University Press is a small part of the goings-on at the University. Having studied there, I have a stronger connection than many of my co-workers, who have never visited. Even so, I caught news of an experiment this morning that struck me as very, well, Cambridge University. These teddy bears were launched into the stratosphere via balloon from Churchill College. This was part of a Cambridge University Space Flight Science Club experiment, conducted by an aerodynamics student and a group of children as a way of getting them interested in science. The suits were made by the kids out of foil and plastic bottles, among other things, with sensors to monitor their temperatures and other forces. 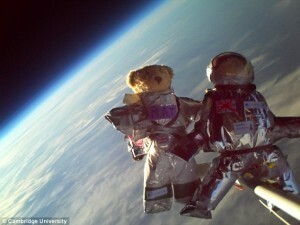 They even parachuted gently back to earth, landing about 50 miles from Cambridge. Get the full story, and more pics, at The Daily Mail.